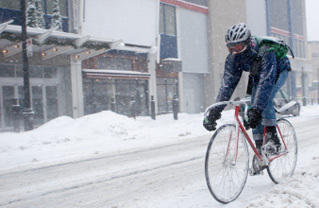 Winter Bicycle Commuting in Akron…No Sweat! Actually, the good news is that you do generate a lot of sweat bicycle commuting on hills…and that’s what keeps your body temperature just about right, even in single digit temps! Now, if it’s Tuesday, it must be bicycle commuting to Tallmadge in snow, sleet, wind, rain and/or hail. The reason you can count on every Tuesday in Akron to be the worst weather day of the week is because it’s my consistent day without a car. I’m in a carshare. 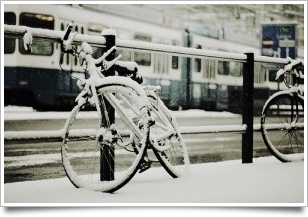 Dress right and smart…and bicycle commuting in winter is a pleasure. Full wool mask under the helmet, fingertip open/close gloves, long underwear, wool socks–you are never cold, just invigorated. Hey, if I can survive bicycle commuting in frigid temps on icy roads and feel great–anyone can! More than half of all American s live less than five miles from where they work according to Bicycling magazine. Only 1.67% of Americans commute by bicycle. In Japan, 15% commute by bicycle; In China, bicycles outnumber cars 250 to 1. About 12 bicycles can be parked in the space required for one automobile. Traffic jams in the 29 major cities cost commuters an estimated $24.3 billion each year. 100 bicycles can be produced for the same energy/resources it takes to build a medium automobile. The average cost of a new car in the U.S. is $13,532; average cost of a new bicycle in the U.S. is $385. Commuting by bicycle produces zero pollution a.k.a. no carbon footprint. The majority of U.S. cities have seen a jump in the number of bicycle commuters–Portland, Seattle, Minneapolis lead–Tulsa, Kansas City, Cleveland are ranked for most improved and having best future. The City of Akron is making great strides in encouraging bicycle commuting–seeing a lot more designated bike lanes popping up all the time. I am still waiting for bicycle rental kiosks downtown and at the U of Akron, more companies providing bicycle commuting incentives to their employees, more paved shoulders with white lane striping and more bike racks in key locales. Akron, you’ve got a little more work to do to become a leading community for commuter and recreational bicycling–but you’re getting there. CHECK OUT AKRON’S BEST EFFORT YET: The Switching Gears website run by AMATS (Akron Metro Area Transportation Study) for a comprehensive look at bicycle planning and promotion for the region–very encouraging. Posted on February 20, 2013 February 13, 2015 Categories Alternative TransitTags Akron bicycling, Akron Metro Area Transit Study, AMATS, bicycle commuting, winter bicyclingLeave a comment on Winter Bicycle Commuting in Akron…No Sweat!